More cool stuff appears outside 2018 Comic-Con! – Cool San Diego Sights! More cool stuff appears outside 2018 Comic-Con! 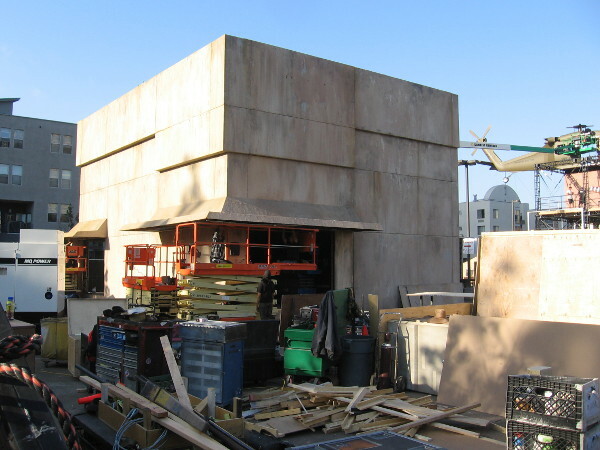 A large bunker-like structure has been built in one corner of Amazon’s huge Jack Ryan Experience offsite for 2018 San Diego Comic-Con. A week to go and more stuff is showing up outside 2018 San Diego Comic-Con! I walked around the Gaslamp Quarter and East Village after work and got some photos! Nothing has appeared yet behind the San Diego Convention Center, or outside Petco Park. Once the ESRI conference ends and the Padres finish their home stand, I’ll bet that changes rapidly! 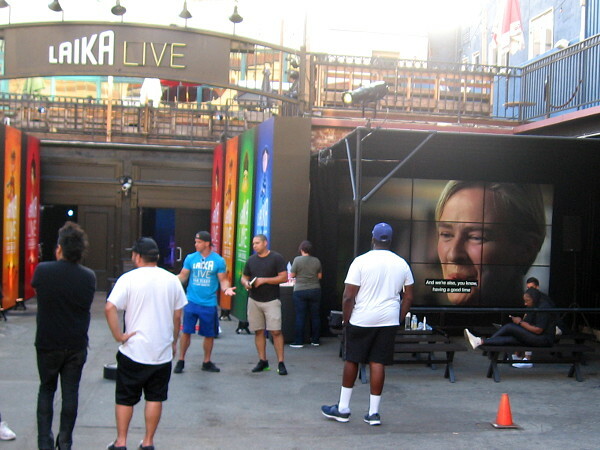 Another photo of the Jack Ryan Experience taken one week before Comic-Con. You can see the zip line. 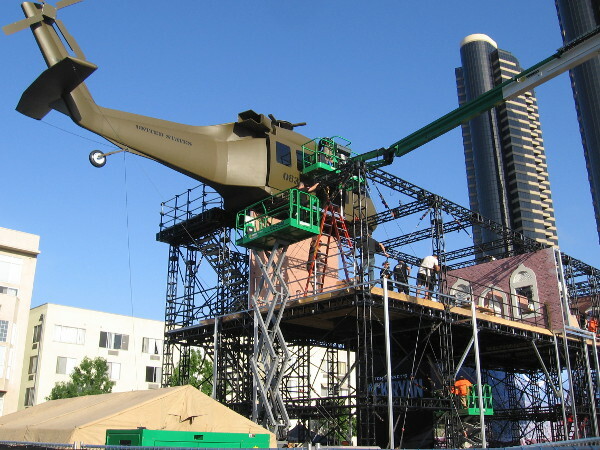 The huge helicopter now stands near a mock building whose doors have Moorish-looking arches. Guys work on the helicopter which seems to have a fresh coat of glossy paint. The entrance to LAIKA LIVE San Diego appears ready to go. It opens tomorrow–Friday afternoon–six days before 2018 Comic-Con! If you read the final update near the end of my last blog post, you’ll recognize this mystery object! 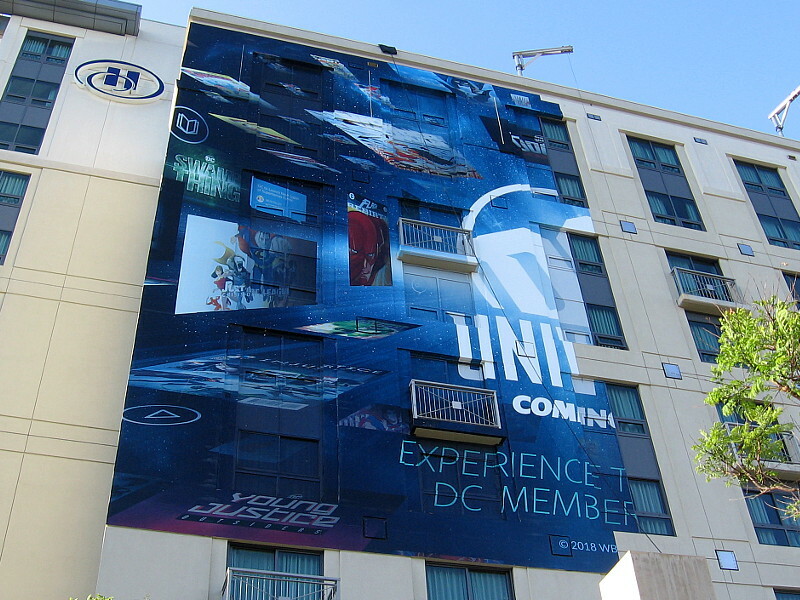 The cool DC Universe wrap on the Hilton Gaslamp appears to be halfway applied. A building wrap on the Omni Hotel is just getting started. Looks to me like it promotes The Gifted. 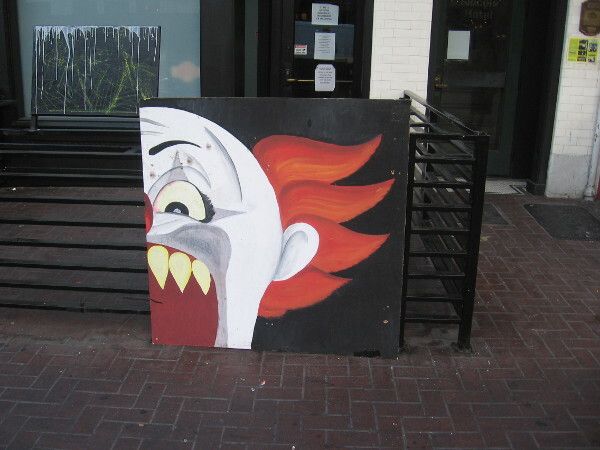 Walking through the Gaslamp yesterday, I saw this scary clown head on the Fifth Avenue sidewalk, but today it’s gone! Amazon is erecting an offsite that promotes their Fire TV and popular channels that it features. You can find it at the corner of Market Street and Seventh Avenue. Graphic on the Fire TV tent. 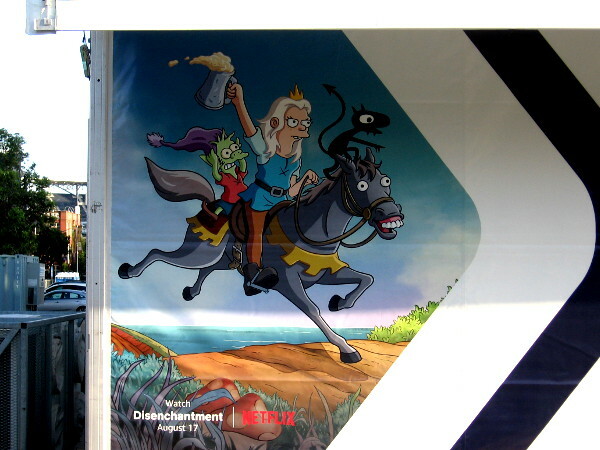 Watch Disenchantment on Netflix starting August 17. Here are photos taken late Friday. Lots of new offsites and wraps are beginning to appear! With less than a week to go, Comic-Con International logos have appeared all over the San Diego Convention Center! A guy driving a lift around the convention center is getting stuff ready for 2018 Comic-Con! A big building wrap on the Omni Hotel will promote Amazon’s upcoming show Tom Clancy’s Jack Ryan. 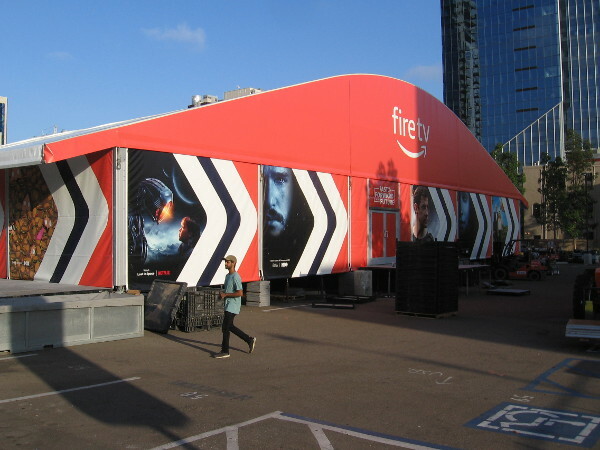 Hulu’s offsite promoting Castle Rock is rising near the New Children’s Museum in San Diego. Workers get the Castle Rock activation ready for 2018 Comic-Con. 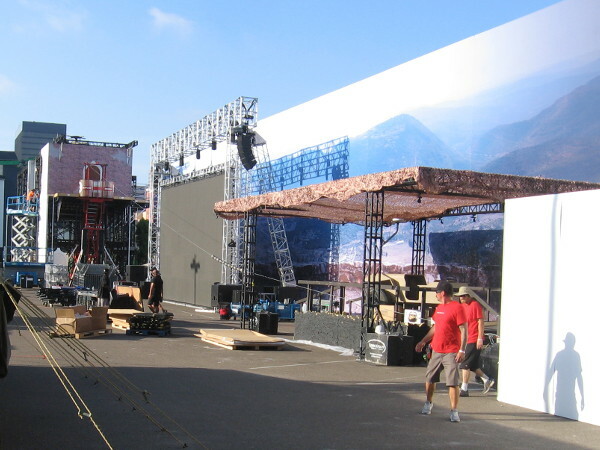 More work has been done on the Jack Ryan Experience. The Jack Ryan Training Field allows fans to immerse themselves in a hyper-reality virtual reality spy experience. The huge bunker-like escape room in one corner of the Jack Ryan Experience has a cool seal. JACK RYAN DARK OPS. 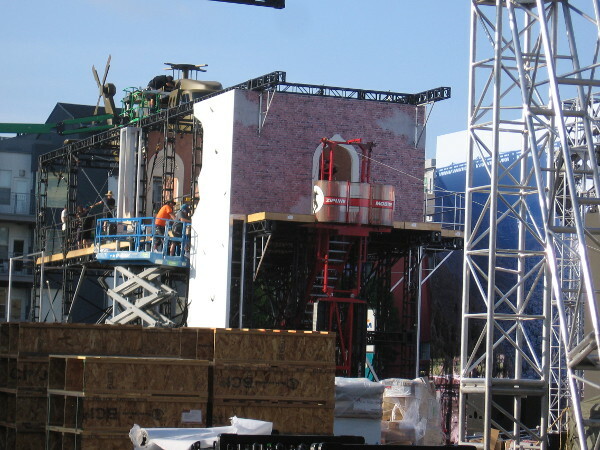 The cool DC Universe wrap on the Hilton Gaslamp is almost completed. A wrap on the Omni Hotel promoting The Gifted, above initial construction of an NBC offsite near the Tin Fish. Fans will experience The Good Place. Guys in charge of erecting The Good Place offsite for 2018 San Diego Comic-Con confer in the summer sunshine. 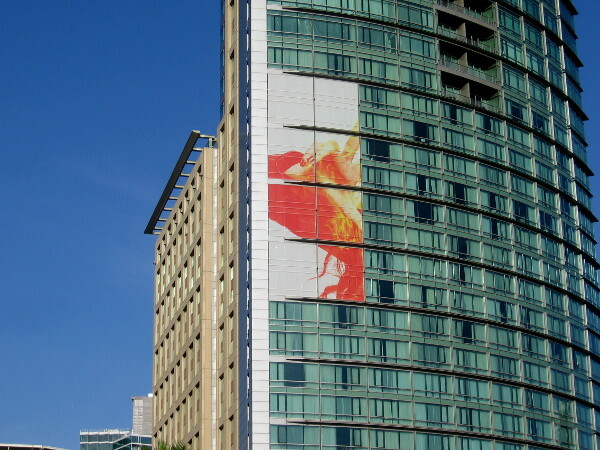 A big Conan O’Brien wrap is being placed on the Marriott Marquis. 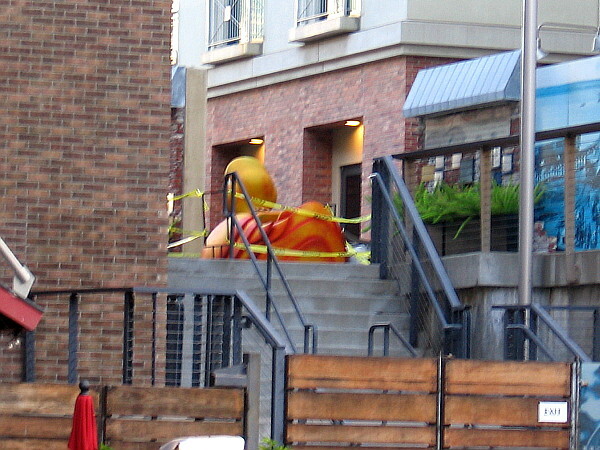 The design appears similar to this year’s Conan trolley wrap. A building wrap is being applied to the Hilton Bayfront, and the Adult Swim offsite has barely begun to appear. No FXhibition as of yet. I don’t recognize what this wrap promotes–not yet! The motorcycle suggests it might by the new FX series Mayans MC–the spin-off from Sons of Anarchy. Feel free to leave a comment if you know! I plan to take tons of photos during 2018 Comic-Con! Pingback: Jack Ryan Experience under construction! – Cool San Diego Sights! Previous Previous post: DC Comics bringing Batmobile to Hilton Gaslamp! Next Next post: A skeleton in plain sight.